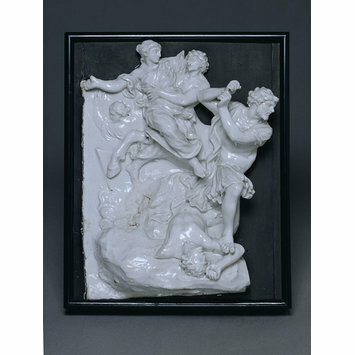 'The Battle between Centaurs and Lapiths' is after a model by G. B. Foggini. Plaque of hard-paste porcelain, Doccia porcelain factory, Doccia, ca. 1750-1755. In the Register books of the Victoria & Albert Museum, this bas-relief was originally catalogued with an attribution to Capodimonte (on the problem of mistaken attributions of Doccia objects to Capodimonte, see MARITANO 2012, p. 14-17).We do not know the archetype on which it is based but a letter written by John Mallet in 1968 and filed in the Register, states that Jennifer Montagu had found a drawing in a private collection attributed to the Late Baroque Florentine sculptor Giovan Battista Foggini, which has the same composition. Besides the stylistic analogies with other drawings and works that were certainly made by the sculptor (see, for example, MONACI 1977, fig. 2, 7), a further confirmation of the attribution of this bas-relief to Foggini comes from the Inventory of Models at Doccia (about 1791-1806), where it is described as: “N. 48Abas-relief with Centaurs fighting Lapiths, in wax. By Gio. Batta. Foggini, with the moulds” (LANKHEIT1982, p.131, 30:48). This relief represents only a part of the left side of the Battle between Centaurs and Lapiths; we know what the entire composition looked like because there is a wax cast in the collections at Doccia which Klaus Lankheit states was executed by Vincenzo Foggini – son of the sculptor because there is a payment registered to him by the factory in 1745 for “bas-reliefs of the marriage of Peiritoo (?) [Pirithous] disturbed by the Centaurs […]” (LANKHEIT 1982, p. 131, n. 48 and plate 59). If we consider that porcelain shrinks 14-16% during firing and that the relief corresponds to the scene in the wax cast, it is probable that the factory intended to reproduce the entire sculpture by Foggini and that it broke during firing. 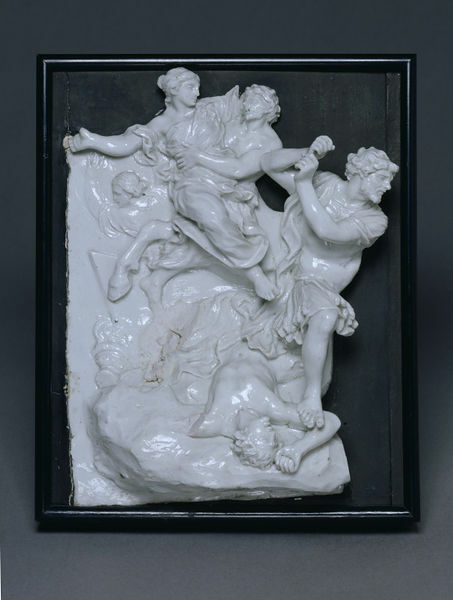 The relief is inserted in a frame which makes it impossible to determine if it is broken or if this detail was made on purpose as a trial piece before proceeding with the execution of the entire sculpture in view of the difficulties involved in making porcelain versions of large size reliefs. In any case, under the right foot of the female figure (perhaps Hippodamia) there is a very evident crack that occurred during firing. Moreover, it is not certain that this composition was made at Doccia since we do not have any evidence of entire reliefs with this subject while, at the Civic Museum in Palazzo Madama in Turin there is another fragment which must have Been made after this relief (D’AGLIANO 2007, p.14, fig.3).Since it is mounted on a pedestal, it has been as curtained that the fragment was modelled separately from the rest of the composition. The style of modelling and the type of porcelain clay used for the execution of this relief suggest a date to the first half of the 1750s. 2005, p. 472, cat. 319; D’AGLIANO 2007, p.